Posted by Dreamhealer in best vancouver naturopath, Healing, Health. Spring is when Vancouver comes back to life. The days are noticeably longer, the crocuses and daffodils have been around for a little while now, and the plum and cherry blossoms are starting their annual show that transforms our city streets. Unfortunately, for the approximately 1 in 6 of us that suffer from seasonal allergies, or allergic rhinitis – this spring beauty can be associated with a feeling of dread. Allergic rhinitis is a hypersensitivity mediated by your IgE antibodies, the same ones responsible for true food allergies (like life-threatening anaphylaxis caused by exposure to peanuts). Allergens (in this case, pollen) bind to these antibodies, causing the release of histamine and other inflammatory molecules stored in mast cells. The severity of your symptoms depends on a lot of factors outside your control – the type of plants in your area, your particular sensitivities, how early and how long they bloom. Another thing about living in a city – particularly Vancouver – is that city planners typically plant only male flowering trees, to avoid the inevitable fruit and the resultant mess. But the male trees are the ones that produce all the pollen that causes your allergies. All that aside though, there are also lots of factors that you CAN control, to help minimize your suffering. Determine what you are actually allergic to. This can be done by a skin-prick test, where small amounts of different allergens are injected just under the skin. This is very accurate, but it’s limited in how many different substances are available, and how much space you have on your forearm. Another, more complete option is getting a blood test done that measures IgE levels in the blood to allergens. This allows dozens or even hundreds of potential allergens to be assessed with a few milliliters of blood – at Yaletown Naturopathic Clinic, we offer allergy panels specific to the most common species in your area. Minimize exposure to the offending substance. As much as you might be tempted to call in sick for the next few months, that’s just not practical. But if you know what you’re sensitive to, the next step is finding out what time of year it’s at its worst, so you can step up your avoidance strategies. Also, pollen counts for most species are highest between 5 and 10 am, so stay indoors if possible during that time. If you have to go outside, face masks can be a very effective (if not the sexiest) option. Keep it out of your house. If you have to go out, try not to bring it home with you. Take outer clothes off at the door and put them in the laundry – even running them through a dryer cycle can blow off much of the pollen. Rinse your face well, gargle often, and consider using a neti pot to flush out your sinuses. And be especially careful to keep it out of the bedroom, where you probably spend most of your time when you’re at home. Rinsing your hair before going to bed will keep a lot of the pollen off your pillow. Get a good air purifier, with a HEPA filter. At the very least, get a small one for the bedroom. Even after doing all this, you will probably still experience the symptoms of allergies. But as you know, these symptoms are not all or nothing – sometimes they’re bad, sometimes they’re quite tolerable. So what else might be contributing? Allergies are a form of inflammation – and if you already have a lot of underlying inflammation, then it doesn’t take much more to push your symptoms over the tipping point. Diet and lifestyle can have a lot to do with it. Smoking, undiagnosed food sensitivities and a diet high in processed foods, refined carbohydrates and trans fats are all major causes of inflammation. In particular, certain foods are high in histamine (that inflammatory molecule at the center of seasonal allergies). Ways to reduce inflammation include moderate aerobic exercise and a diet high in organic fruits and vegetables. And if after all that you’re still experiencing symptoms, it’s time to sit down with a naturopathic doctor for a personalized treatment plan. This will involve all of the above suggestions, as well as things to support your body’s elimination of the allergens and reduce the severity of the reaction. Finally – look into long-term treatments to desensitize your allergies. It’s too late to do it for this year, but there are various treatment techniques that act to train your body not to react as violently in the future when it’s exposed to the same species that have tormented you all these years. These treatments include SLIT (Sub-Lingual Immunotherapy), NAET (Nambudripad’s Allergy Elimination Technique), and LDA (Low Dose Allergen) Therapy. Make an appointment with one of the naturopathic doctors at Yaletown Naturopathic Clinic today, and make this the year you can stop and actually smell the roses! Posted by Dreamhealer in Allergies, Alternative medicine, Naturopathy. Most people who suffer from seasonal allergies (aka allergic rhinitis) will tell you there is almost nothing worse – eyes itching and watering, nose dripping, sneezing – it doesn’t stop. You look sick, you feel sick, but you’re not technically “sick”. And while the rest of us are enjoying the sun and warm temperatures of the early spring, you are just dreading the onset of your yearly allergies. 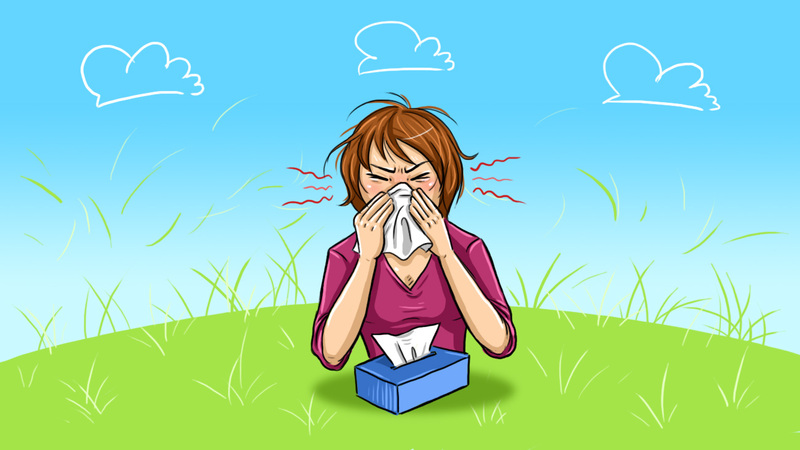 How severely you react to environmental allergens can be based on various factors – total pollen count and the particular species in your area are obvious ones. But what many people don’t realize is that if your immune system is already operating at a certain level of over-activity, you may be primed to react. With patients, I use the analogy of your body as a bucket with various small taps placed at different levels, allowing slow drainage. And as long as the inflow (the things coming in that your body has to process and excrete) isn’t more than the drainage capacity, then everything works fine. But if there are too many things filling up your bucket, eventually it’s going to overflow, in the form of allergies. These inputs can include underlying food sensitivities, chronic inflammatory conditions, and poor diet and sleep habits. Allergy medications have come a long way in how effective they are at controlling symptoms; just one pill a day can keep everything under control. However, many of these drugs carry their own side effects including drowsiness and interaction with other treatments. I still get lots of patients telling me they don’t want to have to take drugs every day just to feel normal. So what are your options? Keep your “drains” open and flowing. Support your body’s natural elimination pathways, including kidneys, liver, lungs and skin. The human body is made up mostly of water – so make sure you’re drinking plenty of it. A general rule of thumb is to aim for two litres a day, more if you’re drinking caffeinated beverages. As well as water, insoluble fibre in your diet keeps bowel movements happening regularly. Engage in regular deep breathing exercises – as well as getting rid of the carbon dioxide, this has the added bonus of decreasing the effects of the chronic stress that everyone is experiencing daily. And try to avoid clogging the pores of your skin with “beauty” products and harmful anti-perspirants. Acupuncture has also been shown to be an effective treatment to ameliorate symptoms. Reduce your inputs. Avoid your allergy triggers whenever possible. Invest in a good HEPA air filtration system appropriate to the size of your living area. (At the very least, get a good one for your bedroom). At the height of pollen season, don’t bring your pollen-laden clothing any further into your house than necessary. Consider dropping it at the door if this is an option. Shaking it out outside, doing laundry more frequently, showering (or at least rinsing your hair) before bed – these are all ways to keep it out of your bedroom, where most of us spend the majority of our time while at home. Consider looking into any food sensitivities that may be contributing to underlying inflammation. Choose a few good quality supplements. This is where visiting your naturopathic doctor comes in. In fact, what you’re already taking may be adding to the inflammatory burden. We’ll help decide which will help and which will just be a waste of your money. A few of the ones we’ll consider – omega-3 fatty acids/fish oils, probiotics, quercetin. But not all supplements are created equal, so either do your research or consult the experts. Is this the year you’re finally going invest the time and effort into taking care of your allergies? Make your appointment to come see one of the doctors here at Yaletown Naturopathic Clinic.